The Huffington Post made a list of the 27 Greatest Pizza Moments of 2014, we've pulled some of our favorites. The idea to make pizza dough out of champagne—and expensive champagne at that—was a group effort. 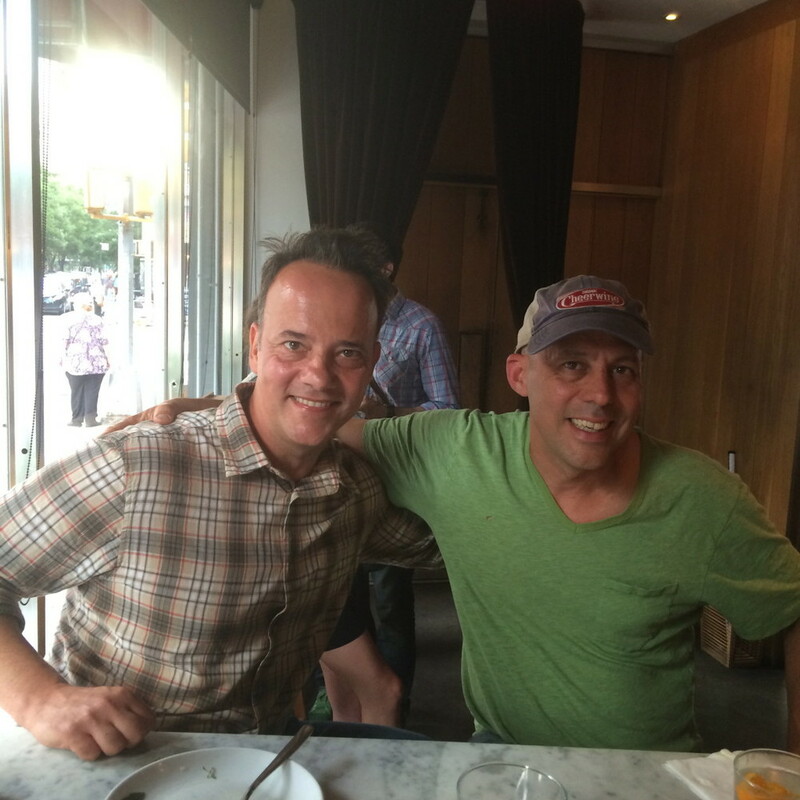 It all started with a brainstorming session with Scott Heimindinger, The Seattle Food Geek . Scott and I sat in my kitchen, eating pizza of course, and tossed around ideas. The thought of making something with a holiday tie was tossed around. Champagne captured the idea of having fun and celebrating—so it stuck with me. We made a beer dough before. That worked, so why couldn't we go big with champagne dough? To figure out what champagne we'd use for this little experiment was the next task. I reached out to Gary Vaynerchuk, who runs the Wine Library. Gary liked the idea and suggested I use Krug "Grande Cuvée" Brut Champagne. It had had good reviews for the flavor and a $150 price tag. I made the dough with the recipe we usually use, only swapping out the water with the Krug. I connected with chef Paul Booras to top the unique, bubbly dough. Paula Booras, culinary rock star, visits the Baking Steel test kitchen! The last time you bit into a crispy, cheesy, delicious piece of pizza, it's highly unlikely you thought, "This is good and all, but I wish this was served in a shot glass." 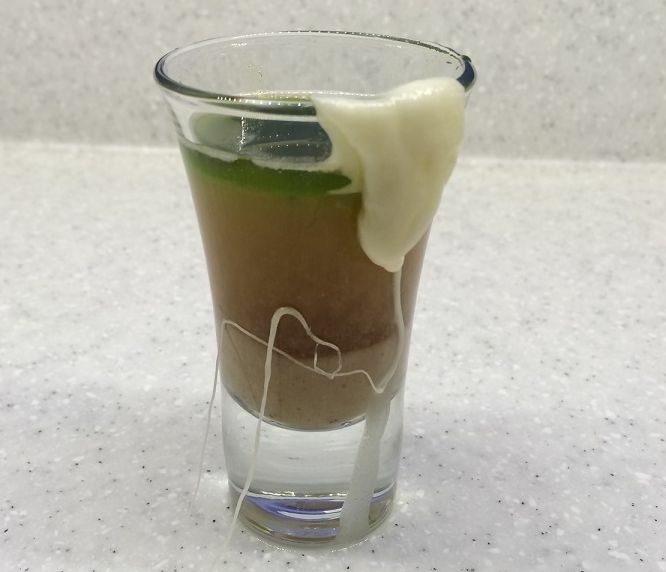 John at pizzagoon.com, came up with the "lame-brained idea" (his words not mine) to make liquid pizza and produced something pretty impressive. While his liquefied take on a Neapolitan-style pizza with Prosciutto di Parma and Parmigiano Reggiano, looks suspicious, he reports it tasted just like pizza. After stumbling upon John's blog, we just had to share his unique experiment. On pizzagoon.com, John catalogs how he made everything from the crust (spelt) to the sauce (tomato water). "So after many trials, I found that the placing spelt on bottom followed by Prosciutto di Parma gravy, then the Parmesan water followed very gently by the tomato water and topped with basil oil was the way to go. Because of the strong flavors in the Parmesan and prosciutto liquids, I added more of the nuanced tomato water for a better balance." The whole mixture was topped off with some melted mozzarella, like a gooey garnish. While again, this concoction isn't winning any beauty contests, the concept and thought behind it are a unique and fresh take on pizza making. This past Saturday, the Baking Steel took stage in our home city of Boston, Ma. The Boston Globe and Whole Foods hosted their third annual Let's Talk About Food Festival in Copley Square. The festival brings to light important conversations about cooking better and eating healthier using the resources around us. 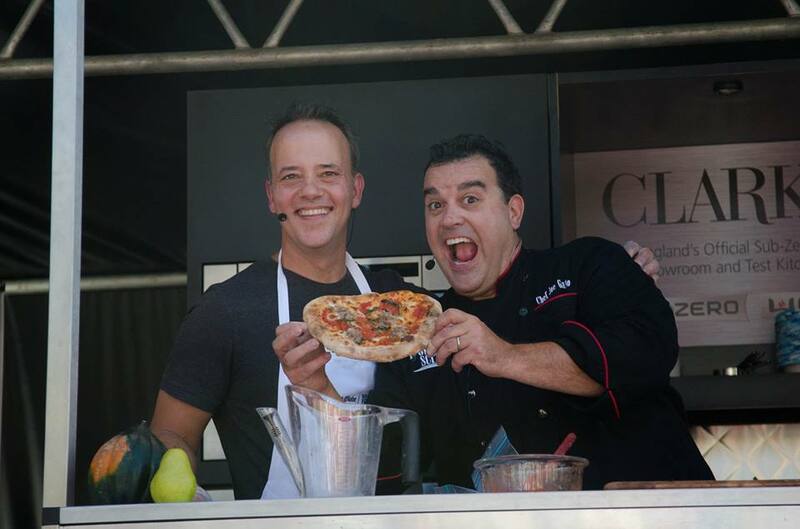 I was pumped up when I got the invite to join my good friend, Joe Gatto of From Scratch, on stage for a live pizza demo at the event. I am game for anything that involves spreading awareness about the quality of the food we put into our body. Hence why I am so big on making my own dough, I like to know what exactly is going into my food. Our live demo was awesome. We made a killer sausage pie. Joe made the mozzarella from scratch, something I am now inspired to do myself. The Baking Steel was used in place of a pizza stone and gave a killer performance. The char was spot on. We didn't pre-cook the sausage, a trick Joe and I both learned from Kenji Lopez-Alt. I highly recommend this method, as it greatly enhances the flavor of the pie. We only ran into one minor speed bump, which isn't too bad for a live show! No, Joe didn't stab me...at least not this time. I did however, cut my hand on the knife I was using. I asked Joe to take over the stretching portion of the demo while the event crew helped fix me up. It was only a few minutes before I was back on stage ready to show off the power of the Baking Steel. New Update: Baking Steel Griddle pre-orders begin June 2nd, 2015. We can't wait..
We've been working hard behind the scenes preparing to launch the Baking Steel Griddle. Like all new ventures, there have been a few bumps and bruises, but I'm happy to report the Baking Steel Griddle will be available in the first quarter of 2015. We have made a few tweaks to the design - extending the size to 18 x 14 x 3/8" and vastly improving the Griddle's surface texture. In order to execute these improvements, our company needed to purchase some additional equipment, which is in production. This was an unexpected delay, but the new equipment will allow us to streamline and improve our manufacturing process. Thank you for your patience and continued support of the Baking Steel! The Griddle is going to be amazing! I can't wait to share it with all of you. Stay tuned for the Griddle Launch on Serious Eats, coming soon! Last week I took a quick trip to New York City, for 24 hours of pizza dreams come true! First on my to do list, swing by Sullivan Street Bakery to meet with Jim Lahey. Yes, you heard right-Jim Lahey, dough, bread, pizza guru! Last year, Mr. Lahey graciously granted me permission to share his sensational no-knead pizza dough recipe, with all of my Baking Steel customers. If you haven't tried it, it is a must! The simplicity is what makes this dough so amazing! And when you combine his dough recipe, with the Baking Steel, you will be making world class pizza at home-guaranteed! Now let's get back to NY. So I went to visit Sullivan Street Bakery headquarters' in Hell's Kitchen, where Jim has catapulted to culinary fame not just for his bread, but for his Roman-style pizza, rustic Italian pastries and cookies and books. In the hour or so that I was there, customers flooded his counter, leaving happy with bags of goodies. I was thrilled to be in his "house." We had a great conversation. We chatted about pizza dough, the ins and out of his business, and some of his future plans. He invited me to join him that evening at Co., the pizza restaurant he opened in 2009. He squeezed me in at 5.30 pm. I arrived and was warmly welcomed to sit at the bar. About 15 minutes later, Jim took me out back to his kitchen where he made me his famous Ham and Peas Pizza. What a thrill to witness the master in action! We shared the pie, a glass of wine and some insightful pizza conversation. I am so grateful to Mr. Lahey for carving so much time out of his hectic schedule and making me feel like an old friend. Thank you, Jim. By the way, the pizza was out of this world! As I mentioned earlier in the post, I was in for a full day/night of pizza fun so the next stop was Paulie G's at 8:00 pm. Joined by a motley crew of friends, Mark Bello and his wife Jenny, of Pizza a Casa fame, Scott from Scott's Pizza Tours, and Jeremy Shapiro from Stir The Pots, I embarked on my second dinner of the evening. Considering it was my first visit to Paulie's, Scott did the ordering which was basically two of every style of pizza on the menu! My hunger for great pizza had been satiated earlier, but hey there is always room for more, right?! One by one these amazing pizzas were delivered to our table. Paulie was in the house, and took very good care of us. Thank you Paulie! After devouring at least one slice from every pie, sipping a few glasses of vino and enjoying more than a few laughs/pizza stories, I decided to head back to my hotel. In less than 24 hours, I had had enough pizza for a month. Cheers to creating some NYC pizza love and memories to last a lifetime! JIm and Andris at Co.
After recently meeting Chef Joe Gatto, he invited me up to his test kitchen to make some pizzas with the Baking Steel. Chef Gatto is currently working on production of his soon to be released show, From Scratch. He sent me over a copy of the first episode and I can honestly say, I have no doubt that it is going to be huge. Seriously, I've never seen a cooking show like it. He literally does everything from scratch, going as far as milking the cow to churning his own butter. We had such a good time making pizzas that when he called me up and asked me to come back again, there was no way I could say no. Joe told me that Kenji Lopez-Alt, Culinary Director of Serious Eats, was going to be there and that they would be shooting a piece for the show. He told me to make some dough, bring my Baking Steel and to get ready for a good time. It was a blast. First off, listening to Kenji always amazes me. He is brilliant but somehow makes it all sound so simple. Kenji and Joe filmed a piece on homemade sausage and then the three of us started cranking out some pies. At first, I was a little intimidated having Kenji work with the dough I made, its not every day that you're making pizzas with a James Beard Award nominee but I was put to ease once he gave me the the thumbs up. I don't want to give away too many details, as you will have to wait and watch once From Scratch is released... but wow, hands down the best pizza I've had in a long time. The way the sausage cooked on the pies was amazing. Inspiration comes from everywhere. As many of you know, I came up with the idea for the Baking Steel after reading pieces of Modernist Cuisine by Nathan Myhrvold. Nathan stated that the best tool to use for making the perfect crust would be a piece of steel. This inspired me to combine two of my passions into one amazing product and I was inspired to share this amazing discovery with food lovers everywhere. We are so excited to be able to give away one copy of Modernist Cuisine at Home. Nathan Myhrvold and Maxime Bilet have created the perfect guide to help any cook master the art of cooking at home. This 456 page state of the art cookbook includes over 400 recipes with step by step photos. Modernist Cuisine at Home will help you perfect any dish, from simple to complex. Enter to win a copy of Modernist Cuisine at Home by commenting below and telling us what inspires your passion in the kitchen. Please keep comments under 160 words. Giveaway ends Sunday, November 24 at 8pm. Remember to check back Monday morning at 10am for the announcement of our winner! We have officially landed in Norway! Since the launch of the Baking Steel, just over a year ago, we have received much interest from our friends overseas. Unfortunately many have been hesitant due to heavy international shipping costs. We have been searching for a solution and today I am happy to announce that we have found an answer. A few months ago we partnered with Christian Nydal, who was interested in setting up a Baking Steel shop in his home country of Norway. Christian and I were able to work together to make this a reality. His website is officially up and running, it offers our Baking Steel and a limited amount of Modern Cuisines. He is also able to provide Storage Sleeves and Pizza Peels. We are ecstatic to be partnered with Norway. Many may not know but our new “Create Some Love” Baking Steel logo was designed and created in Norway by a very talented Norwegian artist. We hope that this partnership will allow others to finally create the crust they have been dreaming of! Protect your BakingSteel, and turn heads at the same time with these unique, and artistic Storage Sleeves. The Baking Steel for Avid Bakers Only? Cooks Illustrated Thinks So. We think it's for everyone! Back in March, America’s Test Kitchen contacted us to order a couple of Baking Steels. We were thrilled at the opportunity to get the Baking Steel in the hands of respected professionals who would put it through a rigorous yet fair kitchen test. Fast forward to May. I grabbed a copy of Cooks Illustrated the day the May issue dropped. Eager to read the results, I flipped to the feature article – a match up between Baking Steel and the trusty Old Stone Oven Baking Stone. See online version here. However, I feel a few points need clarity to ensure Steel users have the total picture and a 100% accurate takeaway from the test. At 15 pounds (5 pounds heavier than the stone), it took muscle to maneuver it in and out of the oven. This, folks, is the secret behind the science! The weight is what makes Baking Steel work. The thermal conductivity of steel is far greater than stone. Steel will conduct and store heat better than stone, thus resulting in pizza that is light and airy, with a crisp crust. Steel also results in reduced bake times. The thicker the steel, the better it bakes. The superheating technique is not necessary when using Baking Steel. Even though by using the broiler, a 4-minute pizza (60% reduction in bake time for pizza) was achieved, the product design inherently addresses bake time (it’s faster and crust is more consistent). However, if you chose to use this technique, bring on the heat, but respect the science. It’s going to cook fast so don’t stray far from the kitchen. Once you get a feel for the Steel in your oven, you’ll nail cook time down to the second. The Baking Steel is for anyone who wants to make a perfectly baked pizza, pure and simple. Yes, “avid” bakers are raving about our Steel everywhere online. But, the science behind the Steel makes up for lack of skill. With the Steel, you can go from pizza zero to pizza hero. And that’s something to get fired up about! So, there you have it – the complete truth from the kitchen test. Now, we want to hear from you. What do Baking Steel users and enthusiasts out there think? Baking Steel: For the Avid Baker or Everyone? Please comment to let us know. Thinking on our feet has become a mainstay around here, and we're scrambling as fast as we can to keep up with demand of the Baking Steel. For real. We're turning them out like lighting around here, and, so far, we've been able to meet demand. What an awesome problem to have! Thanks to all of you raving Baking Steel fans, we're working harder and faster than ever. Hey, we're not complaining. We just want you to have a peek behind the scenes. One product we haven't been able to keep enough of, though, is our storage sleeves. Yes, they're super cool. And yes, they are unique and the perfect accessory for our Baking Steel. But we're having a hard time keeping them in stock. Our vendor is making them as quickly as they can, but right now, we're out of them until January. (Cue sad music here). The good news, though, is that you can still order a Baking Steel, and get cooking as soon as possible. Then, when January rolls around, you can give it a nice, safe storage home in the cabinet. All I Want For Christmas is PIZZA! It's no secret that "Pizza Night" is a favorite meal-time among households everywhere. With all that bread, sauce and gooey cheese, what's not to love! Consider taking your family pizza night to the next level this year by investing in the Baking Steel. It's the gift that keeps on giving, as you and your family create the crust you crave time and time again. Order your Baking Steel by 5 PM Saturday, December 15 for guaranteed Christmas delivery. This guarantee is for continental US only.